Can the LeBron James, Dwyane Wade and the rest of the Heat survive without Chris Bosh? The Heat should expect to play without Chris Bosh for the foreseeable future. The high ankle sprain diagnosis the Heat feared has become a reality and that could mean it will take weeks before Bosh graces the court again. This injury is the most adversity the Heat have faced since the doldrums of November when the Heat went 5-7 over a 12-game stretch. Bosh is the most irreplaceable player on the team. He is the Heat's fulcrum in offensive sets. The Heat play terribly when LeBron James and Dwyane Wade fend for themselves. But don't just take it from us. Heat coach Erik Spoelstra called him the team's "crutch" and their "facilitator." Wade referred to him as he and James' "relief." LeBron admitted Bosh's injury "takes the chemistry out and it takes the rhythm out of the team." And the numbers don't lie either. The Heat have missed him desperately. According to Alok Pattani of ESPN Stats and Information, the Heat score six more points and allows 3 fewer points per 48 minutes with Bosh on the court compared to when he sits. As we can see, the Heat don't shoot nearly as well with Bosh off the court and part of that may be due to their shot selection. The Heat's percentage of shots within five feet drop dramatically from 29.3 percent to 21.5 percent when Bosh leaves. Furthermore, Bosh's inside presence is felt on the boards as well. 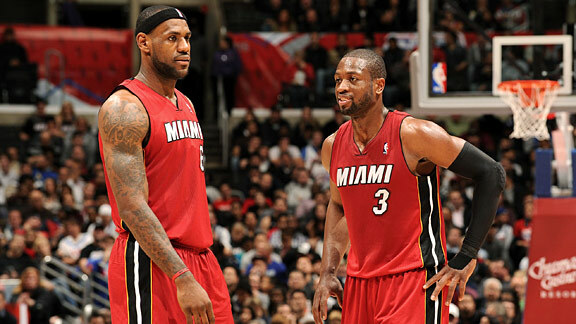 With Bosh healthy, the Heat can maintain a system of checks and balances with the Big Three playing off of each other. But once he leaves, it sends the Heat offense into disarray -- particularly with Wade and James. James proved on Saturday's win over the Raptors that he can survive without Bosh, but it's worth keeping in mind that he did it against the worst defense in the NBA. And the Heat can't depend on Mike Miller dropping 30+ points every time Bosh sits either. But at least the Heat demonstrated they can succeed when James plays sans Bosh. We really can't say the same for Wade thus far. His scores more but at a lower percentage. Take a look at that plus-minus when Wade plays without Bosh at his side. Here we see that the Heat experience a 16-point swing on the scoreboard when Wade plays without Bosh, from +10.3 to -6.2 every 40 minutes. Statistically, Wade shoots at a lower percentage, turns the ball over more, and rebounds considerably less. Theoretically, one would expect Wade to pick up the slack and rebound more with Bosh off the floor but that hasn't happened thus far. All this information doesn't mean the Heat can't it turn around on Thursday against the Knicks. After all, past results don't fully predict the future. But they certainly give us a reason for concern.